There is exciting news in the bakery world this month. 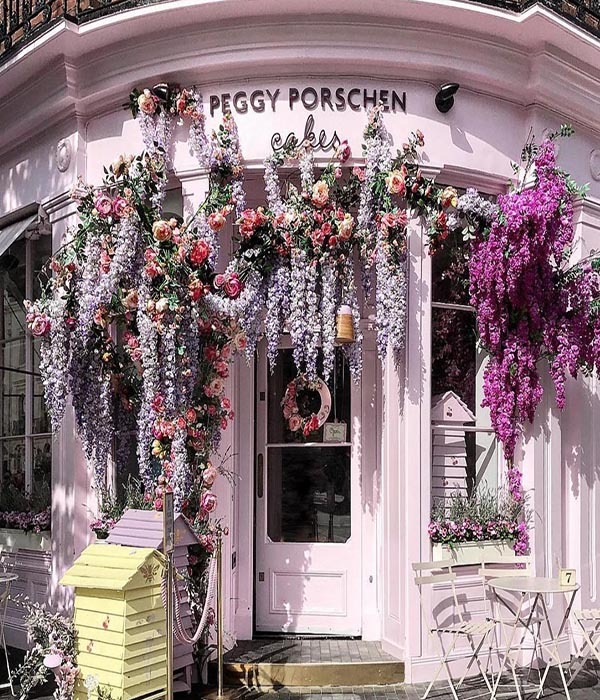 Peggy Porschen, the great British success story is opening a new store on King’s Road, London SW3. Anyone who loves cupcakes will be familiar with the Instagram sensation. Her current Belgravia cafe is a celebration of craftsmanship, romance, fashion and femininity. It’s pink, pretty and perfect in every way. In this month’s local Spotlight, Peggy talks about quitting her job as a flight attendant to become a cake maker, the Great British Bake Off and her new Peggy Porschen Parlour to open in Chelsea. Q: What was the eureka moment when you decided to become a cake designer? A: Baking was my passion as a young teenager, but in my heart, I always knew I wanted to become a ‘cake designer’. To my delight, I discovered the art of ‘British Sugar Craft’ while working as a flight attendant, a job which took me on regular trips to London. I was asked to make a wedding cake for two colleagues at Lufthansa, and they were so delighted with the result that they really encouraged me to leave flying and become a cake maker. Soon after, I quit my job and the rest is history. I never looked back and feel truly blessed that I was able to follow my calling. 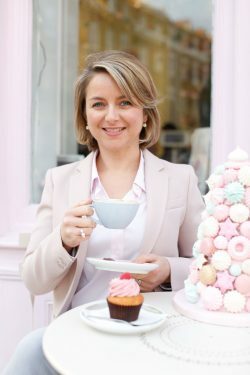 I went on to complete Le Cordon Bleu’s ‘The Grand Diploma of Cuisine & Patisserie’ in 1999, and was lucky enough to hold a number of prestigious Pastry chef positions in London before ultimately fulfilling my ambition of launching my bespoke cake company in 2003: Peggy Porschen Cakes. We are a hands-on British company that not only reflects my life-long love of baking, but also celebrates beautiful craftsmanship, inspired by romance, fashion and femininity. Q: What is the most unusual cake you have designed over the years? A: The most ground-breaking creation at the time was the edible chocolate Faberge Egg, which I created for Elton John’s White Tie & Tiara Ball in 2003. This was my first celebrity commission. I made 500 of them and the next day there were so many celebrities in OK! Magazine featured with the eggs. I even got a mention on the BBC’s morning television programme and my picture was taken for OK! Magazine. It was a very exciting time. Q: Would you like to appear on the Great British Bake Off? A: I catch the odd episode when I can and it really is a great show. It’s wonderful for viewers to be able to see the passion and hard work that goes into patisserie, it really is a form of art. Q: If you could bake a cake for any celebrity – who would it be? 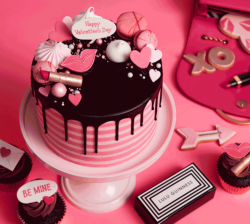 A: We did a collaboration last year for Valentine’s Day with Lulu Guinness and I was so inspired by her designs when it came to that particular cake collection. I adore her lips and heart range and would love to make another cake in that style. I would love to bake a cake for Reese Witherspoon if there ever was the opportunity to do so. I love her on screen in Big Little Lies, but I like her even more on her Instagram channel. She has so many talents and seems to be a passionate home baker herself. She is a fantastic hostess and domestic goddess. She seems to really care about everything she does and takes great pride in her family life at the same time. I could imagine that she would be great fun to hang out with. Q: Tell us about your new store on King’s Road? A: We’re so excited to be opening our second Peggy Porschen Parlour, and new flagship store, on the King’s Road. The new opening will very much continue the look and feel of our Belgravia location, however, it is a much bigger space and therefore allows an evolved offering. We will be introducing an ‘all day indulgence’ menu, to include savoury options, as well as a bookings system for our dining area. We will also have a dedicated subterranean events space, complete with a pink champagne bar. Absolutely every corner of the space will be packed with prettiness and will ultimately offer an elegant and relaxed space in which to enjoy exquisite tastes from 8am-10pm, seven days a week. Q: If you were stranded on a desert island, what three cakes would you take with you? A: Right now, my number one choice would be our new for Christmas 2018, Cosy Cashmere Christmas Cake. It’s a wonderful light coconut sponge layered with a smooth almond meringue buttercream and covered with a cosy cable knit effect. Heaven! My second choice would be our classic Banoffee cupcake – it’s my all-time favourite. For my third choice, it would be our Strawberry & Champagne Layer Cake. It’s light, moist and tastes wonderful with a glass of champagne, or a cup of tea or coffee. It’s also very pretty. A: I’m very house proud and love design features with mixtures of old and new with splashes of colour. I’m most comfortable in a beautiful family space, but with careful attention to detail and exquisite features throughout. Q: What do you most like about London? A: I like London’s diversity in culture, food and design and all the exciting opportunities it has to offer as a city. Although, it’s a global metropolis, it never feels too big and every area has its own character and identity. London never stops and there is always something new to discover. Q: What has been the hardest or most elaborate cake you have ever made? A: We’ve done so many over the years, but one of the most memorable has to be very carefully transporting 500 bespoke mini cakes for a Middle Eastern Royal Wedding. A: My mum and my grandma have both been hugely influential in inspiring my love for fine food and exquisite flavours. My childhood in Germany was always filled with the scent of baked treats! My mum has always been the most perfect homemaker and hostess, with very high standards when it comes to styling and execution. Family events and seasonal celebrations were always the highlight of the year and planned to perfection with a huge amount of love for the details. This is absolutely where my passion and attention to detail comes from. 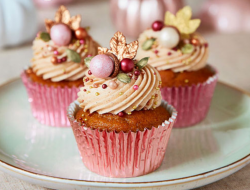 Q: What are the biggest trends in the world of baking this season? A: Being visually extraordinary is of course a huge trend in line with the popularity of social media sharing. Our brand has always been about prettiness and exquisite attention to detail, with products made using the finest ingredients and traditional baking methods, so while we’ve embraced this trend, we’ve always stayed true to our core brand values. For Christmas, we are all about being cute and cosy. We have enchanting gingerbread cabins, adorable Nordic inspired character cookies, cupcakes and divinely dressed cakes. The range will launch on November 12 and we will have a seasonal Parlour installation to match. Q: Can you give us three cake-making hints or tips? A: It might sound obvious, but perfect measuring of weights and liquids is crucial to get a cake right. Also, I prefer baking several layers of sponge in shallow tins rather than baking one tall sponge in a deep tin. This ensures that the cake bakes more evenly and does not get too dry around the edges. I always have some plain sugar syrup at hand, which I brush over the sponge right after baking. The hot cake will absorb all the moisture and the crust stays soft. Also, sugar syrup is a great way of adding extra flavour by infusing it with a citrus zest or spice, for example. A: The kitchen! Baking is my passion and my husband and business partner Bryn, is also a trained chef. For us work and home life very much overlap. Q: And finally, any advice for anyone who wants to embark on a career in baking? A: For the cake business, I would say the first step is to learn about the reality of the industry through as much work experience as possible. I didn’t know it then, but in hindsight my old boss at Konditor and Cook gave me lots of useful advice, while I was working as a cake decorator. The second step would be to be unique and find your USP. The patisserie market is so oversaturated now that you have to be able to stand out from the crowd. Thirdly, know your market. Do plenty of research within your area and choose your location wisely. The new King’s Road Peggy Porschen Parlour opens in spring at 219 King’s Road, London SW3. Visit the Belgravia café at 116 Ebury Street, Belgravia, London SW1W (peggyporschen.com). It offers a selection of cakes, afternoon tea, a cakes menu, sweet treats, wedding cakes and courses.